Hello friends we know very well that at present time billion of users have to use WhatsApp facility in his Smartphone. There are lot of tips and tricks which you use in your Smartphone or Desktop Personal Computer or Laptop which helps you very much but due to the absence of knowledge most the person don’t use these tips and tricks. This article will helps you how to run WhatsApp messenger on your computer and smartphone at the same time. But before applying this tips and tricks on WhatsApp first I recommend you to read carefully complete steps of this article. We know very well with the help of WhatsApp meagreness any smartphone user will be able to send or received any type of text, audio or video messages to each other, but if you want to use your smartphone to talk another persona and at the same time you also want to continue chat using WhatsApp or, what all WhatsApp chat history of your or any other person phone, or you feel any kind of problem during typing and message on your smartphone then you have to use this given trick form which you will be able to easily run or share your WhatsApp on your Desktop PC/ Laptop along with your smartphone at the same time. For doing this task you have to use WhatsApp Web trick on your computer or laptop. WhatsApp Web is an extension which is based on the computer of the WhatsApp account which is currently running on your smartphone. With the help of WhatsApp Web any user will be able to synced all messages between your computer and your smartphone and you will be able to view and continue chat using WhatsApp on your computer and the smartphone at the same time. The WhatsApp Web is available for Windows, Android, BlackBerry smartphones. 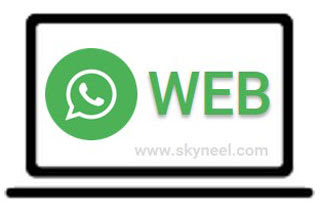 There is no need to create another account to run WhatsApp on your computer or laptop using WhatsApp Web because WhatsApp Web automatically accessing the same account after scanning the QR code of your smartphone WhatsApp Web and then share your data on both devices. Step 1: First you must need an active WhatsApp account on your smartphone, proper internet connection facility on both devices like your smartphone and computer / laptop apart of that you also need updated version of web browsing software like Google Chrome, Firefox, Safari, Opera etc. Step 4: Hold your smartphone in-front of your computer during scanning the QR code on your computer. When scanning process is finished WhatsApp is running on your computer / laptop screen and you also get a notification message on your smartphone that you will be logged in computers. Now, you will be able to view all WhatsApp chat history and also continue chat with others using your computer or smartphone both. Note: If you want to immediately disconnect WhatsApp Web from your computer or laptop then tap on the “Logout from all computers” option from your smartphone or you can also choose Menu > “Log out” option from your computer or laptop. Now enjoy this trick and share your knowledge with others. If you like this article then give your important suggestions in the comment box and also share this article with others. Thanks to all.